Recently my unsupervised, unaudited, self-paced, multi-semester independent-study course has taken a turn (back) towards constitutional law. Originalism & Precedent: Why respect for precedents – even those of the non-originalist variety – isn’t necessarily incompatible with the Constitution’s original meaning. Originalism & Declaring War: Prakash argues, on originalist grounds, that any military action beyond limited self-defense requires a Congressional declaration of war. Yoo & Delahunty disagree, as does Ramsey. Prakash responds. In general, methinks Prakash has the better of the argument; however, his response seemed to gloss over the strongest point (IMHO) made by the critiques – i.e., that Washington arguably waged war against the Indians of the Ohio River Valley without an explicit Congressional declaration. Origins of Judicial Review: Yoo & Prakash thoroughly demolish the notion that judicial review is incompatible with the original meaning of the Constitution. Those inclined to complain that judicial review lacks explicit authorization anywhere in the Constitution may wish to take note. Executive Duty to Disregard: Why the Constitution requires that Presidents refuse to enforce unconstitutional laws. His account of such a refusal by Jefferson WRT the Sedition Act was particularly interesting. Symbolic Speech & the First Amendment: why the original meaning of the latter encompassed the former. Interesting; however, IMHO the key issue isn’t whether (say) flag-burning could be termed “speech”, but rather whether laws banning flag-burning were an impermissible “abridgment” of “the freedom of speech, or of the press”. As Footnote 132 of Volokh’s article notes, on this key question, “The scope of the liberty of speech and press in the Framing era was notoriously disputed.” It’s worth noting that “seditious libel” – though condemned (along with the Sedition Act) by history – had, in the Founding era, a respectable intellectual pedigree. Early History of American Conscription: This article (perhaps inadvertently) suggests the compatibility of federal conscription with the Constitutional original meaning, given the early Congress’s passage of the Calling Forth Act – a law explicitly authorizing criminal penalties for militiamen who disobeyed a Presidential order calling them to federal service. As for those (e.g., here & here) inclined to deem conscription “involuntary servitude” prohibited under Thirteenth Amendment, note that 1) this phrase was basically lifted from the Northwest Ordinance; and 2) both road service laws and a militia act (*) were passed by the government established by the Ordinance. Federal Judges, Good Behavior, & Impeachment: Apparently the latter two phrases aren’t synonymous; i.e., removal of a federal judge via methods (e.g., statutes authorizing removal in the event of criminal convictions) besides impeachment may be constitutionally permissible. The Thirteenth Amendment’s Exception: I wasn’t terribly impressed with his “original public meaning” analysis, which featured some quotes from the Thirteenth’s Congressional drafting history, but little other contemporaneous evidence (e.g., ratification conventions, campaign documents, newspaper articles). And, color me cold-hearted, but I’m also unimpressed with his implication that, if the Thirteenth’s original public meaning necessarily permits enslavement of convicts, then originalism is DOA. The Constitutionality of Paper Money: Trashes the notion – much-beloved by goldbugs & hard-money folks – that fiat money is unconstitutional. Frankly I was surprised by the conclusion. (*) See chapter I, Laws passed from the Commencement of the Government to the 31st of December, 1791, Laws of the Territory Northwest of the Ohio, 1788-1800. Wells Fargo Sues Itself: This sounds more like a technicality than anything substantive; still, it’s kinda funny. Following up on this post, I ran down some more comprehensive stats on the public debt; it turns out OMB’s data stretches back to 1940. In Table 1, positive #’s denote a decrease in privately-held Treasury debt. By way of reference, the Clinton-era surpluses lowered outstanding privately-held debt by 1.4% of GDP in 1999, & 2.4% of GDP in 2000. Had Bush II followed the “Smart Bush” scenario mentioned above, the federal government would’ve entered the current economic downturn with a much stronger balance sheet, with privately-held debt at 12.6% of GDP instead of ~31%. In such a scenario, our flexibility in dealing with said downturn (and the associated financial crisis) would’ve been correspondingly greater. Ditto our breathing room – e.g., via multi-year fiscal stimulus – in the event that the downturn ended up being a prolonged one. Even under the “Smart Bush” scenario, Obama’s budget plans would’ve remained unaffordable. See Fig. 2 here. Although this scenario would’ve allowed Obama to accumulate debt from a lower starting point, the upward trajectory of said accumulation would’ve remained obvious. This confirms something I’d long suspected: The reduction in debt/GDP ratio between 1948 & 1974 resulted not from a decrease in nominal debt levels, but rather from increased nominal GDP. We never paid off the debt from WWII. Instead, we refinanced it; added only modestly to it; and shrank the debt/GDP ratio via inflation & economic growth. Totally-Unrelated Aside: I wasted way too much time here this morning. HT: The Baseline Scenario. This post makes a very important point, one that I wish was better understood across the political spectrum. 2. Differences in fundamental presumptions (i.e., axioms) regarding human nature, the world, ethics, etc. I’m sure there are many others. (at worst) fail to see where their opponents are coming from, and instead conclude that those opponents are guided by malice, ignorance, or irrationality, rather than reasoning derived from different starting presumptions. I find both such practices unwelcome, & unhelpful to the cause of rational discourse. A query from Steve got me curious about how the ratio between housing prices & residential construction costs might have varied over the years. Fig. 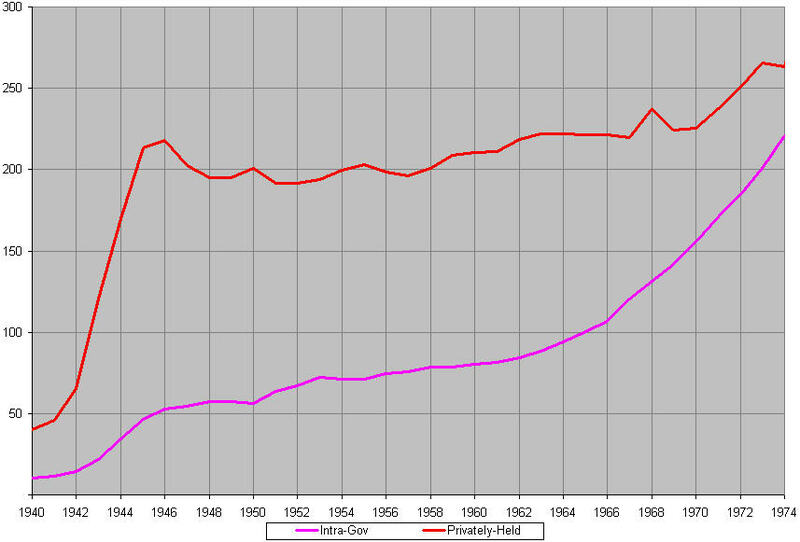 1 plots the ratio of Case-Shiller indexes & the Census Bureau’s Fisher Index of New One-Family Houses Under Construction, for each month from January 1987 through April 2009. 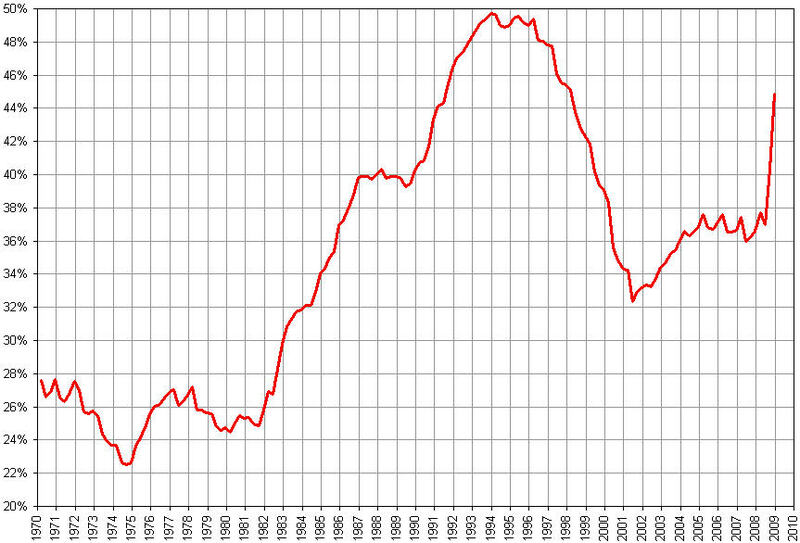 For comparison purposes, I’ve also plotted the ratio of Case-Shiller to CPI (with 2005 = 100). Fig. 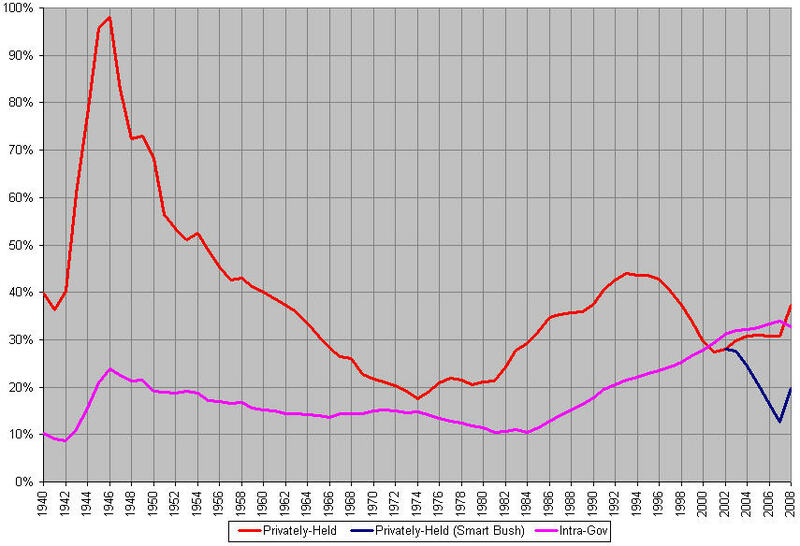 2 takes a longer view, plotting the ratio of Robert Shiller’s Real Home Price Index & Real Building Cost Index for 1890-2005. That blacks, on average, are less intelligent than whites and hispanics. Unless this is intended to be facetious, or a swipe at those who hold that belief, it is rather ugly. It is also the elephant in the room. It boils down to this: While it’s fine and dandy to have totally objective and meritocratic criteria (we’ll assume for the sake of the discussion that such criteria exist), those who favor them tend to be quiet about the results thereof. What if the most rigorously neutral, color-blind, ethnicity-blind, objective criteria for school slots or hiring still produce egregiously disparate results? Is the philosophy that it’s just too damn bad for those who lose out? Should they set their sights on less demanding, lower-skilled, and therefore (usually) less well-paying jobs, resigning themselves to their fate? No one who supports meritocratic criteria ever seems to want to answer this. So it’s sort of like this–a certain theme in areas of the right goes somewhat as follows: We must be meritocratic, even if fewer (fill in the race or ethnicity) get to school or get jobs. This is because of poverty and bad culture, not race. But we don’t support the government getting involved in poverty alleviation programs, since those (don’t work, aren’t the government’s business, etc. ; again, fill in the blank); and, gee whiz, we don’t know what to do about the culture. So, the effect is that minorities get passed over, nothing can be done, that’s just the way of the world, too bad, the end. Anybody see something wrong with this picture? — Premise: IQ, for the American population, follows a normal distribution, with a mean value of 100, and an SD of ~15. — Premise: A person’s IQ score is largely a function of intractable factors – e.g., genetics – over which that person has no control. — Premise: Our society is currently structured such that IQ is a significant – and increasingly-important – determinant of socioeconomic success. I.e., the higher your IQ, the more likely you are to be wealthy, upper crust, etc. Our society has basically morphed into an IQ-based meritocracy. In this sort of IQ Meritocracy, low-IQ individuals will almost inevitably end up filling the ranks of the working poor, the unemployed, those without health insurance, etc. Note that these people wouldn’t be welfare queens or the “undeserving poor”; even if they work hard, are disciplined, go to school, etc., they still end up at the bottom, _through no fault of their own_, simply because, in our society & economy, rewards are doled out as a function of IQ. Query: As a matter of justice, is society not obliged to assist – perhaps via income-support programs – such low-IQ individuals, whose position in the bottom run of the socioeconomic ladder is almost entirely the result of factors beyond their control? …”right-wing” public-policy recommendations do not intractably follow from such acceptance. Confession: The above argument was cribbed from one of the later chapters in “The Bell Curve”. To some, we will have made a case for increased income redistribution. The data in this book support old arguments for supplementing the income of the poor without giving any new guidance for how to do it. The evidence about cognitive ability cause us to be sympathetic to the straightforward proposition that ‘trying hard’ ought to be rewarded. Our prescription…is that people who work full time should not be too poor to have a decent standard of living, even if the kinds of work they can do are not highly valued in the market place. When we began work on the book, both of us assumed that it would provide evidence that would be more welcome to the political left than to the political right, via this logic: If intelligence plays an important role in determining how well one does in life, and intelligence is conferred on a person through a combination of genetic and environmental factors over which that person has no control (as we argue in the book), the most obvious political implication is that we need a Rawlsian egalitarian state, compensating the less advantaged for the unfair allocation of intellectual gifts. For its part, the right must state forthrightly why it things that a free society that tolerates large differences in outcomes is preferable to an authoritarian society that reduces them. Talking about group differences does not require any of us to change our politics. For every implication that the Right might seize upon (affirmative-action quotas are ill-conceived), another gives fodder to the Left (innate group differences help rationalize compensatory redistribution by the state). These don’t quite strike me as the type of comments a right-wing racist neo-Nazi might make, but perhaps I’m overly naïve. You are currently browsing the Random Musings of a Deranged Mind blog archives for July, 2009.